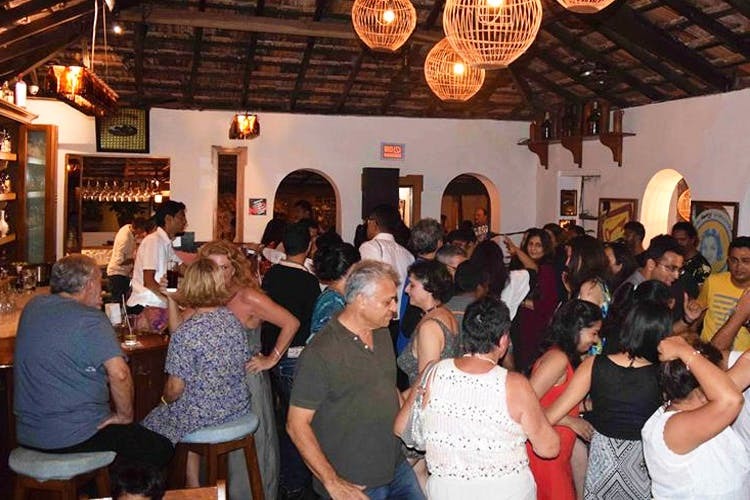 If you ask any of the locals where to go to party in Goa, and especially on a Friday night: the answer will most probably be Cavala. Though it is no longer the quintessential local bar and tourists have discovered it a while back, it still manages to retain its loyal Goan customers. They are the ones who will be busy jiving away, knowing all the other regulars, and the staff there, as well as Marius of course. Marius is the current owner and someone you just cannot miss with his stately moustache, whilst he is towering over you. Marius inherited the place from his father, the late Lino Jose Menteiro. The man, who moved to Goa sometime in the 70s is living the Goa dream! In the 70s sometime, he packed up from Bombay, moved to Goa and bought the land where Cavala now stands. It showcases some great local bands on different nights playing rock & roll, retro aimed at all those Goans who live to jive and jitterbug the night away. Currently, they have local favourite Tidal Wave playing on Fridays and Smooth playing on Saturdays. They occasionally also have bands visiting from other cities. On some weeknights, there is, of course, an older Goan crowd that comes to enjoy some classics on the house piano. They will enjoy their meals and then be dancing away, transporting you to a ball of the olden times. It is a sight to watch and learn some moved from. And they offer delicious feed for those dancing away and needing refuelling. You have to try their lettuce-wrapped beef burger in the local bread poi. Cavala in spite of its celebrity clientele, still manages to remain unpretentious, warm and friendly in the ambience and their hospitality.